The Dodge Challenger is made at FCA's Brampton Assembly Plant. WINDSOR, Ontario -- Fiat Chrysler Automobiles Canada will idle a pair of Ontario assembly plants for two weeks each in April, the company confirmed Tuesday night. The Windsor Assembly Plant, which builds the Chrysler Pacifica and Dodge Grand Caravan minivans, will be down the weeks of April 8 and April 15. 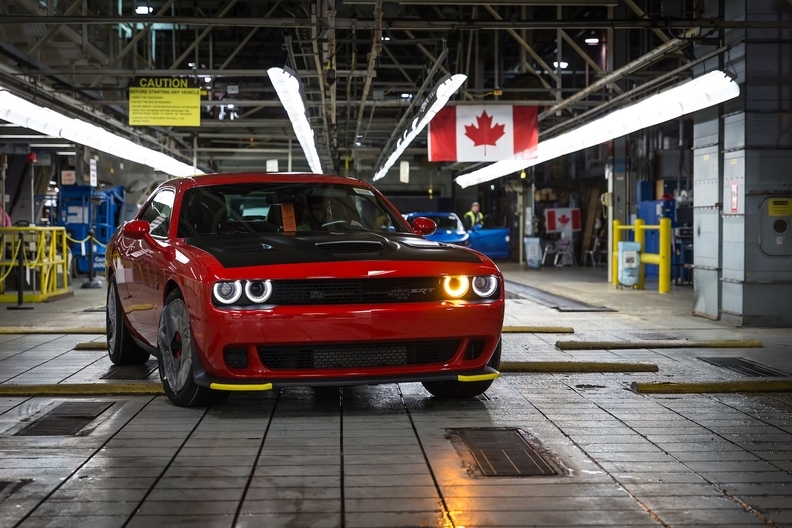 The Brampton Assembly Plant, which produces the Chrysler 300, Dodge Charger and Dodge Challenger, will be down the weeks of April 1 and April 8. The shutdowns are to allow the automaker “to align production with demand,” FCA Canada spokeswoman Lou Ann Gosselin said in an email to Automotive News Canada. The company has already temporarily idled the Windsor plant three times in 2019. The plant did not operate the first two weeks of January in order to adjust for inventories. It then idled the plant the week of Feb. 18 because of a parts shortage, the company said. Gosselin said, “regular production schedules are expected to resume in April. About 6,000 employees at Windsor Assembly build the Dodge Grand Caravan, Chrysler Pacifica and the Chrysler Pacifica Hybrid on three shifts daily, usually six days per week. Running at full volume, the plant produces nearly 1,500 minivans per day. Pacifica sales in the United States in 2018 were unchanged at 118,322, off just 48 units from the year before. In Canada, Pacifica sales were down three per cent to 5,999 in 2018. The Pacifica had 88 days of supply in the United States as of March 1, 2019, according to the Automotive News Data Center. The Grand Caravan had 20 days of supply. Similar data isn't made public in Canada. About 3,500 employees work on two shifts at the Brampton plant. Gosselin said Brampton was previously down the first two weeks of January. Chrysler 300 sales in the United States totaled 4,586 through February, down 32 percent. Challenger sales were down 28 percent to 6,869 units while Charger sales were off 8 percent to 11,757. The Chrysler 300 had a 76-day supply on March 1 while the Challenger and Charger had supplies of 116 and 71 days, respectively. In Canada, 300 sales were down 30 percent to 390 units through the first two months of the year. It’s more positive news for Brampton’s two other products. Challenger sales were up 93 percent to 453 units and Charger sales rose 38 percent to 920. Unifor officials didn't immediately respond to a request for comment.